House of Denmark came to Clicked Studios needing a major revamp of their current website. The modern European furniture retailer had built their old website using internal tools that made their content and inventory update process very slow. The layout design had also started to show its age as it had been built years before the mobile revolution. To bring House of Denmark’s website into modern times, Clicked Studios created a whole new mobile-friendly responsive layout design that reflected their brand’s unique modern and European furniture design philosophy. With a focus on clean lines and negative space, House of Denmark’s new layout design hit the mark. Behind the scenes, the new website is powered by a fully functional content management system. Instead of having to worry about code every time they want to add a new furniture category or product to the website, House of Denmark’s staff can quickly add their new product pictures and content with ease. House of Denmark had invested heavily in search engine marketing. Monthly traffic levels were healthy, but Clicked Studios noticed that many visitors were being wasted due to ineffective conversion and list building strategies on the old website. During the course of launching the new website, an emphasis was placed on implementing new strategies to convert more website visitors into newsletter subscribers. After the new website was launched, new prospects started joining the list immediately. Over the course of a year, sign-ups for this new list surpassed the other lists House of Denmark had been building over the past 5 years. At the one year mark, list growth equaled 250% compared to prior lists and is still growing to this day, with all time list growth standing at 325% in 2017. 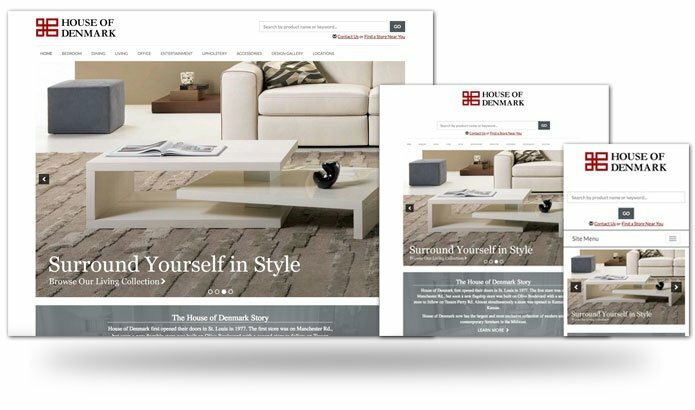 With their new strategy in place, House of Denmark can effectively continue to communicate with prospects and buyers without being forced to pay for ads each time.